The ICD-10-CM Expert for Home Health and Hospice: with Guidelines include our hallmark features and format that make facing the challenge of accurate diagnosis coding easier. 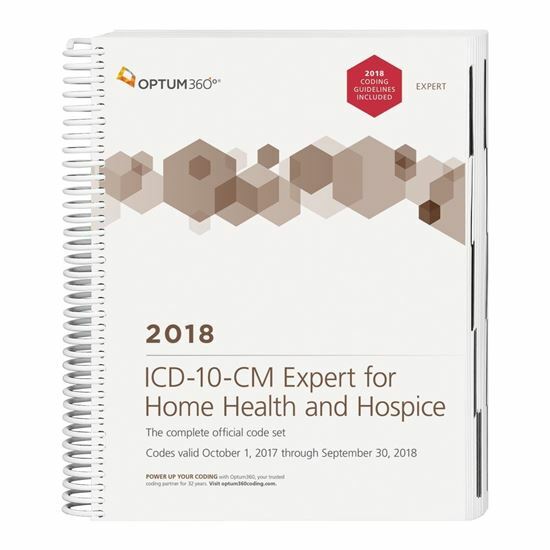 Use the code book that contains the complete ICD-10-CM code set and the familiar Optum360 coding and reimbursement alerts for home health and hospice including color bars and symbols that identify diagnosis codes for clinical dimensions, non-routine supplies and non-cancer hospice diagnoses. Ordering your book with Guidelines means your book will come with the complete, official ICD- 10-CM code set for home health and hospice and the updated 2018 coding guidelines bound together. Depending on when the guidelines are available, your code book may arrive after Oct 1, 2017. New — Optum360 Edge — Two delivery options.Do you need the 2018 code set early for education, training and updating internal coding resources? Select early delivery and get your code book before Oct 1, 2017. Updated 2018 guidelines will be provided in a booklet that will be shipped separately at a later date. Do you need the 2018 guidelines bound in the book? Select the code book with 2018 guidelines. Books may arrive after Oct 1, but are guaranteed to contain the complete updated 2018 code set along with updated 2018 guidelines. • New — Optum360 Edge — Snap-in tabs. Use the snap tabs to quickly reference index entries and sections, tabular chapters, and appendixes. • Optum360 Edge — Supplementary appendixes. Additional information covering home health and hospice prospective payment systems, quality initiatives, OASIS-C1, and case mix groups. • Optum360 Edge — Case Mix Quick Pick Cards. These handy 8.5” x 11” laminated cards identify clinical dimension diagnoses, non-routine supply diagnoses, and non-cancer hospice diagnoses.